Preity Zinta’s Star-Studded Wedding Reception Looks Spectacular! 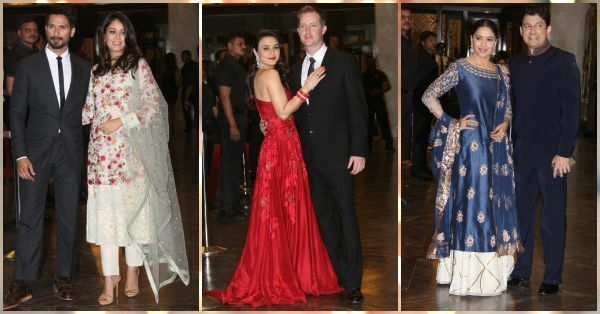 We've been waiting for this since Preity Zinta tied the knot with Gene Goodenough - the star-studded wedding reception that HAD to follow! A few days ago Preity and her family made the trip back to India. But what we assumed was just a family trip ended in a spectacular bash to celebrate the newlyweds! And here are some amazing pictures from the much talked about celebration! 1. The glow on Mira's face is just beautiful! And Shahid Kapoor, father-to-be, looks as dapper as always! 2. And we think this couple will definitely be next to throw a wedding reception - Yuvraj Singh and Hazel Keech! 3. And Madhuri Dixit, looking just too elegant for words… But then again, when does she not?! 4. Lady in black - Lara Dutta is a quite a vision in that gorgeous lace saree! 5. And, of course, Preity's Veer Zaara co-star is present too - and looking just SO good! 6. Finally, the newlywed couple themselves - don't they just look SO happy together?! Images: Viral Bhayani MUST-READ: Bipasha & Karan’s Honeymoon Pictures Are Just TOO Adorable! MUST-READ: These Post-Wedding Pictures of Asin and Rahul are SO Adorable!